‘Proper salt water woman!’ by Erica Izett. ‘All one’ is a conversation in paint with many of the artists at the Lajamanu Community… a response to their own paintings. … There was much yelling in Warlpiri and a final agreement that we are ‘all one’. I was ordered to paint up my country. Paths cross. Sometimes they cross twice, and when this happens something different occurs. In 1987 Naomi Howard had the job of ship’s carpenter on a square-rigged topsail schooner participating in the First Fleet re-enactment for Australia’s Bicentenary celebrations. Like the First Fleet crew, her path was about the cross with Aboriginal Australia. The Aboriginal Bicentenary protests were massive and initiated a turning point in the White Australia consciousness and especially the art world, which from this point became intensely interested in Aboriginal art. Naomi spent her spare time on the journey reading the history of Australian colonization. Henry Reynolds’ ‘The Other Side of the Frontier’ ‘was a big awakening … by the time I reached Sydney I had gone through something of a metamorphosis…. It was 1988 and I was now ready to enter into relationship with Black Australia”. But her crossing with Aboriginal Australia would be very different to that of the First Fleet 200 years earlier. In 1994, Naomi drove the 600 km stretch of dusty road from Alice Springs to the small Walpiri community of Lajamanu on the northern fringe of the Tanami Desert to take up the position of Council Coordinator. She and Warlpiri were about to cross paths. The Warlpiri had been on their own Long March. Forcibly trucked to Lajamanu in the late 40s and 50s they promptly walked 500 kms home only to be taken back. Those who decided to settle after several walk-backs to their Dreaming sites, fiercely maintained their heritage. Lajamanu painters are known for their resilience and independence, qualities that chimed with Howard’s own. They had made a ground painting at Paris in 1983, declaring that they would never join the painting movement begun at Papunya 12 years earlier. But after 1988 the art market had suddenly changed and they relented. However they painted without the support of the government art centre model. The Lajamanu women Howard engaged with were senior painters, law women and teachers. To these elders the living connection to country embodied and activated in the process of painting and ritual -make one whole – a locus of identity, to be strengthened, shared and passed on. While this was confirmation of Howard’s own sense of identity, which revolved around her connection to nature and making, the depth of Lajamanu connections to place through art only highlighted Howard’s relative lack of such connection and aesthetic integrity. As a child Naomi had made her own bush camps along Sydney’s pockets of bush and stream. At 15 she was independent. 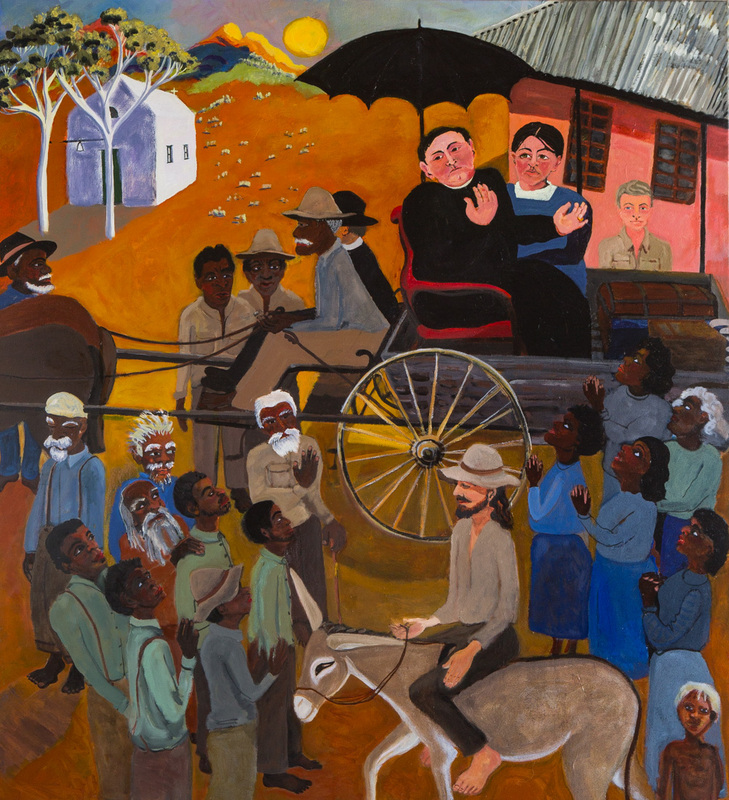 In her early teens she admired the ochred barks in the Methodist mission shopwindow and Albert Namatjira’s signature outback colours at the Art Gallery of NSW. At 17 she was on a sea passage to chase favourite masterpieces seen only in reproductions (of the likes of Van Gogh, Turner, and Rembrandt) to be savoured in the real. She fostered her own skills as an innovative cabinet maker, builder, painter, forager and passionate bush-woman. It was at Lajamanu she became versed in a more profound connection and reading of country: ‘they opened the door to a deeper understanding of being human and my relationship with my country’. Howard’s formative years were those mid-century modernists also interested in the identity of place, like Fred Williams, Arthur Boyd, Margaret Preston and Ray Crooke, but she had not taken the conceptualist path of her generation. However her Aboriginal world opened new horizons, and she cites the liberating influence of Ginger Riley Munduwalawala and Emily Kame Kngwarreye. Above all her mentor was Lorna Napurrula Fencer, one of the most innovative of the Lajamanu artists, Fencer took Howard under her wing. She was Naomi Nangala’s Ja ja (grandmother) and took her tutorial role seriously. “She would turn up on Saturdays and demand that I paint in order to learn the Jukurrpas (creation story imagery) appropriate to me. Howard cites Fencer as her painting teacher “She gave me confidence… Lorna and I just loved painting together… we were both outsiders…” Like Fencer, Howard’s biography reverberates with autonomy and courage. She too pushed barriers of gender and convention. Both worked outside their respective cultural institutions. ‘Outlandish and indomitable’ Fencer forged her own career using tradition iconography with bold initiatives “pulling off exquisite works of art”. She also taught Howard that country is sentient and embodied with powerful forces, affiliations and potential– the substance of kuruwarri and essence of ancestral presence which links people and country. One can see in the works of ‘All one’ (2011) what’s increasingly important to Howard – connection and interdependence with place. She paints the sea, scrub, produce, wildlife, and family (all cultures and times), acknowledged through the lens of the everyday and simple pleasures: the dogs, the beach, tides, birds, garden, changing light. A touch of enchantment, an allowance for magic, for mythology, for transformation fills the work. These are the pleasures of those who live close to the ground, listen to its beat, heed its warnings and signs. In some cases the paintings act as a pointer to a deeper consciousness. The paint dances across the canvas to ancient rhythms and sharp contrasts of flora and fauna, flight and vessel: all loaded signifiers. In Wallaby Business ancestral Wallaby dancer/creators hold blood red-ochred coolamon pouches; Honoring the Old Mothers : haunting bones of ancient Tasmanian blue gums “living when Palawa walked among them”; Howard’s boat, lovingly handcrafted by a proper salt water woman– sings of journeying, freedom, and cycles in tune with ancient technologies. There is an environmental mysticism found in these works. Above all there is an honesty to her craft, an ode to simplicity but with deference to the power of the elements, ecology and the passage of time. “I am aware of the people who were here before me and of the underlying intricate tracery of people and events.” Howard paints in a very recognizable European tradition that owes much to that mid-twentieth century generation of artists who felt betrayed by the legacy of the European Enlightenment and sought an alternative way of being and belonging. However she has crossed paths with a much older Aboriginal tradition, and this profoundly shaped her art to produce work that combines elements of both. This is the connective conversation that animates this exhibition. Howard acts as witness not only to her patch but also to the land of her awakening, the secrets of the ancestors, and to the country her Indigenous friends hold so dear. From her studio overlooking the secluded bay at Murdunna in southern Tasmania, Howard makes paintings that rouse us to care for place as if it is a personal ancestor, to understand, to feel and retell its stories.